Wildcats' Anna Young dribbles past Tawas defenders. 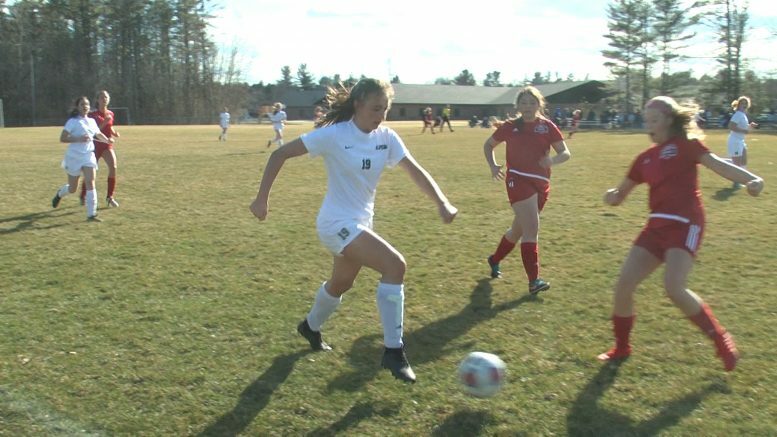 Tawas, Mich. — The Alpena Wildcats traveled to Tawas for their third girls soccer game of the season. 8-year Head Coach Tim Storch wanted to see improvement in the Wildcats defense after their season opener performance when they allowed four goals on six shots. Alpena fixed their mistakes and topped Oscoda 8-0, and then on Friday the green and white defeated the Braves 4-0 improving to (2-1) overall. Alpena goalkeepers Eden Zann and Alexandria Villarreal have split games, and together they have two shutouts this season. Give credit to Tawas goalie Victoria McEwan. The senior saved many shots on goal with her quick acceleration and ability to track the ball. Four different Wildcats scored goals against Tawas: Anna Young, Alexis Pilarski (second career goal), Kameron Schultz and Taylor Tolsdorf. Young now has four goals this season. Shultz and Jenna Leeck have been great freshmen additions to the lineup. The Wildcats will be back in Alpena on Tuesday, April 16th for their home opener against Boyne City at 5 p.m. Then the green and white will start Big North Conference play on Thursday against Traverse City Central at 6 p.m. in Wildcat Stadium.